Why Advocate for Science Policy? How does congress allocate research funding? Do researchers have intellectual property rights? What food policies solve both hunger and obesity? Are there career opportunities in outer space policy? What can local and state governments do about climate change? If you’re interested in any of these questions, you’re not alone! Students across Illinois are doing the same thing. 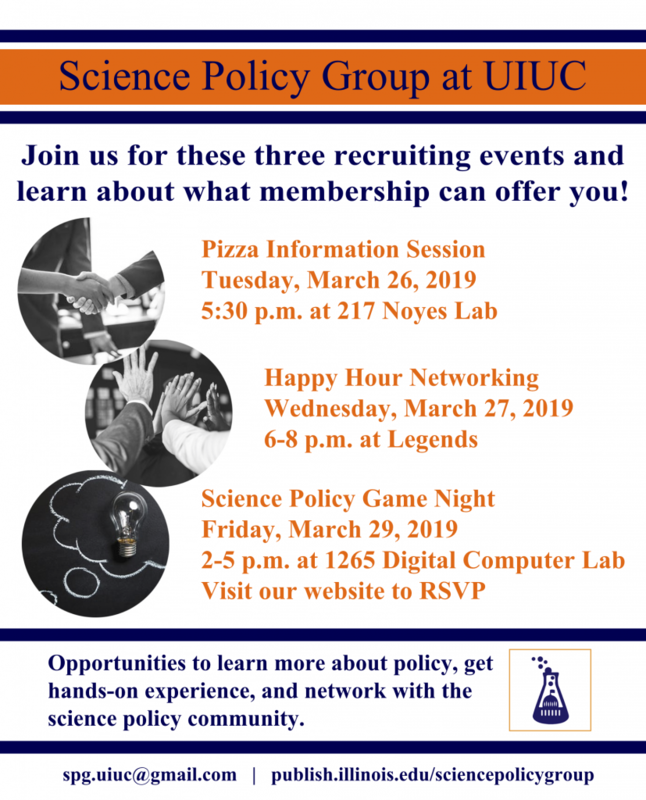 Learn more about the UIUC Science Policy Group at one of our March recruiting events. Can’t make these events but still want to get involved? If you would like to run in 2019-2020 elections or nominate a colleague, please fill out the form here. All nominations are due by midnight CST on Wednesday, April 3rd 2019. Besides nice spring weather, March also brings Science Policy Group three very exciting events at the end of March, plus new leadership opportunities. Keep reading on for more details! The Science Policy Group is currently accepting nominations for all leadership positions. Working with the SPG gives scientists-in-training valuable and unique experience organizing events, leading groups, and meeting politicans. If you want to help bring our group into the next academic year, you can fill out the Google form here. Nominations are due by midnight, April 3rd. If you are interested in learning more about our group and want to get more involved with us, join us for an information session on March 26! During this session, we will meet the group’s executive board, learn a brief history of our fairly new group, and some of our future aspirations. We will also discuss the opportunities available for active group members. Pizza will be provided! SPG Happy Hour at Legends! After learning about our group at the info session, come join us in a more causal setting at Legends Bar & Grill on Green Street. We will have a sign up showing our location. Come hang out with the executive board and grab some dinner with us! March 29, 2-5p, 1265 DCL. RSVP here. The Science Policy Group is bringing back its popular game night, featuring a revamped ruleset and a brand new opportunity to learn about how science and policy intersect. In this unique role playing game, a natural disaster has struck your city and has destroyed its power grid. You will work with your neighbors to design an energy and water policy while working with business and the environmental lobbies to restore power. Students/Faculty/Staff are all welcome. Pizza will be provided, but space is limited so please RSVP as soon as you can! “A Ph.D. is valuable in a huge range of rewarding career options, and moving from academia to new opportunities can result in even greater impact, if not more fun,” says Dr. Mary E. Maxon of the Lawrence Berkley National Laboratory. Anyone that had the pleasure of interacting with Dr. Maxon throughout the day can definitely attest to the latter half of that statement. She had many fun stories to tell from her time in the White House and just as many insightful career tips for those looking toward Science Policy as a career option. Maxon visited the University of Illinois at Urbana-Champaign by invitation from the University’s Chemical Biology Interface Training Program on February 14, 2019. During her visit Dr. Maxon gave a career seminar entitled, “Adventures in Science and Science Policy: From Industry to the White House and Beyond,” where she detailed her meandering path through four academic institutions, including her graduate program at UC-Berkley in Molecular Cell Biology and postdoctoral research at UCSF. Dr. Maxon went on to manage projects at two biotech start-ups before being the first scientist recruited to develop the California Stem Cell Institute- her first science policy job. From their she moved to the Gordon and Betty Moore Foundation and then was recruited to the Office of Science and Technology Policy (OSTP) in the Executive Office of the President, under the Obama Administration. Although it wasn’t an easy decision for Maxon to move across the country and work at the White House, she was ultimately won over by the words of President Barack Obama during his 2009 inauguration speech, “We will restore science to its rightful place.” She realized, she could be apart of that effort, or at the very least, have a front seat to witness what may get in the way of achieving that goal. During her tenure at the OSTP, Maxon worked to advise the President on many science and technology issues, reviewed regulations from the EPA, FDA, USDA, and developed initiatives, like the National Bioeconomy Blueprint. She advised that anyone interested in learning about, or working in, science and technology policy should review the document Science and Technology Policymaking: A Primer written by her colleague Deborah D. Stine. “Graduate STEM Education for the 21st Century” as she discussed the recent push to reform graduate education in the United States such that the training is supportive and inclusive of the diverse nature of PhD scientists and the careers they enter into. One of the critical elements to progressive change and democratic renewal in America is good public policy, and that is only made a reality by the inclusion of the scientific community in this endeavor. Throughout her career Dr. Maxon has led by example, inspired more than a few people in the process, and given us resources that we can use to be involved in the workings of our government. Workshop participants look on as Gus Greenwood reviews some tips and tricks for communicating your work to the public. “Know your audience” –this was one of the key points addressed on Wednesday, February 6th at the first Science Policy Group Writing Workshop. In conjunction with the Writers Workshop on campus, the Science Policy Group Professional Development Committee held a 90-minute workshop on communicating science to non-scientists. The guest speakers included Ananya Sen, an experienced science communicator and doctoral candidate in MCB, and Carolyn Wisniewski, Director of the Writers Workshop, along with her co-presenter Gus Greenwood, an MS student in Environmental Engineering. After a brief introduction to the Science Policy Group, Ananya kicked things off right away by having the 26 attendees participate in a stimulating mental exercise. She had them write down how they would explain their research to three different audiences: 1) An expert in their field, 2) A 5-year old, and 3) A peer not in your field. The exercise not only put their research in perspective, but also challenged them to remove the jargon. At the conclusion of the exercise, Ananya answered several audience questions about her journey, how she got started, and what she blogs about. Overall, the attendees felt that the activity and her personal experiences were a valuable part of the workshop. For the remaining hour, Gus presented helpful pointers in communicating science to the public, such as knowing your audience and getting to the bottom line right away. He illustrated his point by giving an example of talking to his grandmother about his research –how could he pare down and use metaphors and similes? Gus then transitioned into an example of a form of science communication, a policy memo. He explained the basic structures of a policy memo and then introduced the upcoming National Science Policy Network memo writing competition. Many of the attendees expressed interest in the competition and with a March 1st deadline, the timing of the workshop was perfect. As a final activity, Gus and Carolyn passed out examples of different samples for analysis, including a blog post from a well-known physicist, a Washington Post opinion article, and a few policy memos. After skimming through them and coming back as a group, they pointed out the differences in writing styles, target audience, and technical language used. There was productive conversation and discussion regarding the written examples and collectively, the group agreed that the writers were able to get their point across. At the conclusion of the workshop, participants were satisfied overall with the workshop content and activities. They learned some valuable tips on communicating science to the general public and information on the upcoming memo writing competition. In addition, Carolyn and Gus provided everyone with additional resources available to them through the Writers Workshop. From Biochemistry to Food Science and Human Nutrition to Economics, the departments represented by the attendees were diverse but still united in the goal to communicate science to the public effectively. This workshop was a great introduction and springboard for future partnerships with the Writers Workshop and science communicators alike to help people from various science backgrounds communicate science to the public. Event coordination and write up by Alisa King. Dependence on coal has led to long term problems: air pollution, rising carbon dioxide levels, and global warming. Although nuclear energy was meant to offset these problems, disposing nuclear waste has become a bigger issue. It is therefore imperative to consider sustainable and environmentally-friendly sources of energy. To this end, the Future Energy Jobs Act (FEJA) was passed in 2016 to encourage clean energy measures. The Act was the culmination of a collaborative effort among consumer advocates, environmental groups, and energy companies. The budget for the energy projects will be from an existing 2% charge on electricity bills. FEJA also takes advantage of net metering, a process that allows consumers to send surplus solar energy, during the summer, back to power grids in exchange for credits. These credits can then be used to offset the cost of energy during other parts of the year. The resulting legislation will also cause an expansion in wind and solar energy industries with the aim of making them 25% of Illinois’ energy source by 2025. Furthermore, FEJA aims to make renewable energy accessible to low income communities and provide job training in clean energy industries. On September 14th, 2018, the UIUC Science Policy Group and the Union of Concerned Scientists hosted a town hall to discuss the impacts of FEJA. 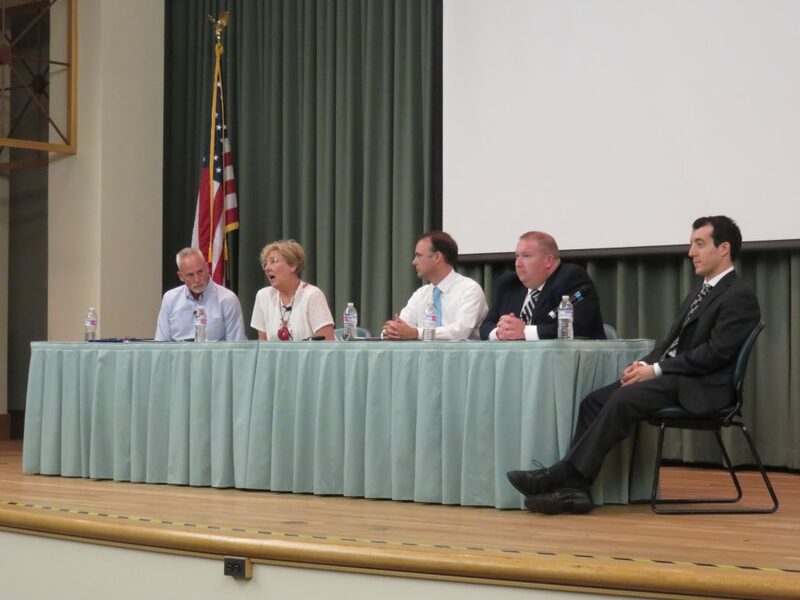 Invited panelists included Illinois State Senator Scott Bennett, Scott Tess, Reverend Cindy Shepherd, and Tim Montague. What are the benefits of expanding solar development? Sen. Scott Bennett, representing Illinois’ 52nd district, said that solar panels are more popular than wind turbines. Resistance to wind turbines is due to their size and the resulting noise. Therefore, expanding solar development will allow people to purchase solar panels easily. Tim Montague, from Continental Electric Construction Company, added that current nuclear facilities will close in 10 years, rendering the land useless. However, the same land can be used to install a solar farm. What are the renewable energy accomplishments leading up to FEJA and since FEJA? According to Scott Tess, Urbana’s environmental sustainability manager, Urbana was focused on getting the market primed for solar installation before FEJA was passed. After FEJA, the market for solar array installation has expanded, and Scott said that some of the legislation’s financial incentives can be used to install solar arrays on closed landfills. How does FEJA benefit lower income communities? Rev. Cindy Shepherd, Central Illinois Outreach Director for Faith in Place, said that FEJA provides training resources for low income communities leading to job creation. Furthermore, FEJA has special incentives aimed at making solar energy accessible to such communities. Solar panels have finite lifetimes and will eventually need to be replaced, which is an expensive process. Is that a good trade off? Coal delivers cheap energy at the cost of global warming, which is a bad trade off. According to Scott Tess, solar panels have a lifetime of 25 years and produce clean energy. Furthermore, the end products of coal and nuclear energy are useless, whereas the solar industry is working on ways to recycle solar panels. Cindy added that it is easy to despair over the climate threats we face. However, it is important to move forward and take measures to reduce our dependence on coal. Therefore, the environmental movement should aim at pointing out the dangers of coal and the advantages of clean energy. Cindy Shepherd addresses a question from the audience regarding trade-offs in solar energy expansion. 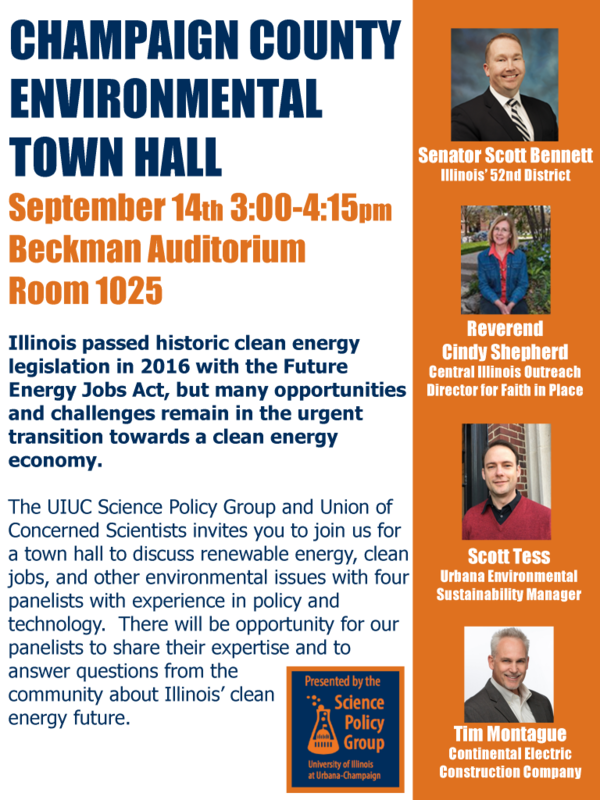 Join us in the Beckman Auditorium on September 14th from 3:00-4:15pm to learn how the Future Energy Jobs Act, passed in December 2016, will promote development of renewable energy and clean jobs. Panelists come from the Illinois Senate, Faith in Place, Urbana’s Environmental Sustainability Division, and Continental Electric Construction Company. Audience members will have an opportunity to ask questions toward the end of the town hall. Participants practicing their networking skills! 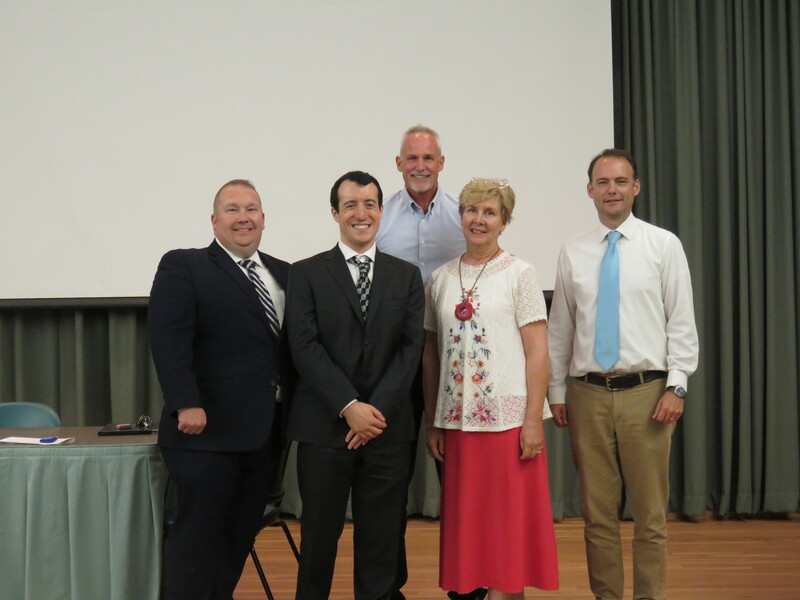 On September 4, the Science Policy Group Professional Development Committee, in collaboration with Derek Attig and Mike Firmand of the Graduate College, ran a networking workshop. The workshop primarily focused on learning how to craft elevator pitches targeting legislators and other governmental policy makers, as well as more general networking tips for a broader audience. We really wanted to create a single event where participants could both learn how to network and also have the opportunity to practice with experienced professionals, so we invited four additional faculty/staff members from the University to join us for a reception following the workshop. Those professionals were Dr. Ashlynn Stillwell of Civil and Environmental Engineering, Dr. Gay Miller of Veterinary Medicine, Doris Dahl of the Beckman Institute, and Melissa Edwards of the Office of the Vice Chancellor for Research. Both Dr. Stillwell’s and Dr. Miller’s research inform policy, and they each have previous science policy work experience- Dr. Stillwell at the Congressional Research Service and Dr. Miller through the AAAS Science & Technology Policy Fellowship. Doris Dahl and Melissa Edwards are both experienced science communicators. Derek and Mike ran the first 45 minutes of the workshop, giving a very interactive presentation on how to network, why it is important, and some common strategies. Tailoring this to the science policy group, Mike kicked off the session by having the group practice elevator pitches, pretending we were pitching our research or job idea to a policymaker. Participants commented that condensing their “pitch” down to 30 seconds was very difficult. Key takeaways here included to NOT to think of it as “dumbing down” the statement, but instead to choose words very carefully, and then practice, practice, practice! For the next portion of the workshop, Derek gave a more general overview of networking. He emphasized acting as the “host” of the event instead of the “guest,” making sure to introduce yourself to other people and to invite outsiders into your conversation. The goal is to have a few meaningful interactions, NOT to have one extended conversation or to meet as many people as possible. This part of the workshop easily led to the reception, where the professionals spread around the room and participants grabbed some refreshments and began networking with each other. Over 40 people attended the workshop and event registration indicated that participants were from a variety of departments and at a variety of stages in their academic career (undergrad to post-doc and research staff). At the reception, the room was abuzz with conversation, and it looked like everyone who wanted to chat was able to find a conversation partner or group. We saw even saw some contact information being exchanged! Participants had positive things to say about their experience, and the faculty were enthusiastic about interacting with the Science Policy Group again in the future. Ann-Perry Witmer, P.E., M.S., has followed a curious path through life, ultimately coming to engineering in midlife when she enrolled in the University of Illinois’ College of Engineering after a successful career in newspapering. After graduating with honors and becoming the first civil engineering major ever to win the prestigious Harvey Jordan Award from the College of Engineering, she became a practicing professional engineer in Wisconsin, designing water systems for communities throughout the Midwest. She also helped to create organizations that work directly with communities in Central America and the Caribbean to provide engineering assistance for disadvantaged communities in need of safe, sustainable drinking water. 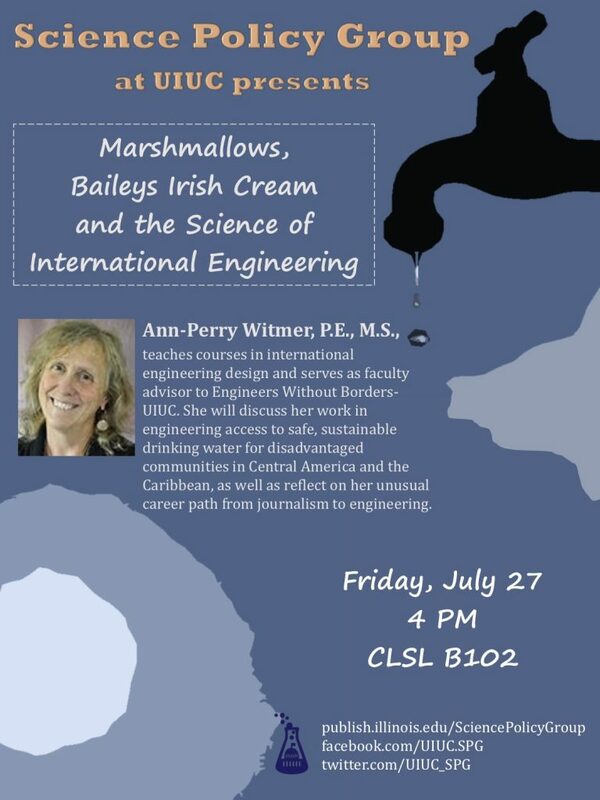 Ann now teaches freshman engineering electives as well as engineering service design courses at the university, and she is faculty advisor to Engineers Without Borders-UIUC and AWWA/WEF. Her service travels have taken her to Central America, Africa, Asia and South America, where she’s developed a deep understanding of the relationship between technical and social considerations that must be co-evaluated for communities in need. She is currently pursuing a novel graduate degree in engineering that investigates the relationship between technical design and non-engineering considerations like politics, culture and economics. 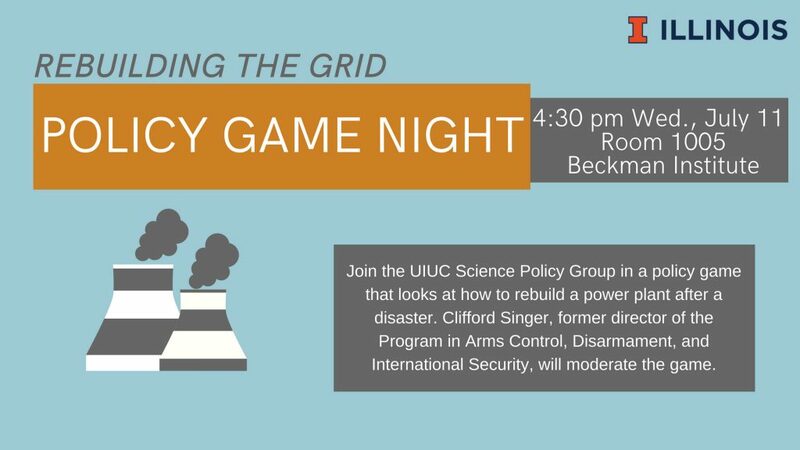 The UIUC Science Policy Group invites you to join our inaugural policy writing game night on July 11th at 4:30 pm at 1005 Beckman Institute! In this game, you and your friends will play the role of an advisory board in charge of rebuilding the power grid for your city after a natural disaster wreaks havoc on the old one. Can you design a proposal to save the grid that is both popular and under-budget? Players will be given a budget and an idea of their constituents and will have to design a plan using a variety of energy sources to create a complete package. At the end of the event, attendees will present their ideas to the rest of the group for discussion. Dr Clifford Singer, the Director of the Program in Arms Control and Domestic and International Security at UIUC, will moderate the event. Refreshments will be provided! Did you know you can use poetry to engage the public in your research? What do you do if someone trusts “alternative facts” more than your data? Want to learn how to be a science comedian? March for Science is live streaming these and other plenary sessions during its S|GNS summit (July 7-8). Visit https://www.marchforscience.com/summit for details! Recordings will also be available after the meeting. Networking Workshop- Save the Date! 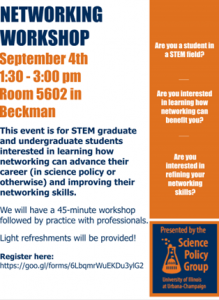 The Science Policy Group is partnering with the Graduate College to offer a Networking Workshop on Tuesday September 4 from 1:30-3 pm at the Beckman Institute! Participants will craft elevator pitches, meet new people and brush up on their networking skills while enjoying some light refreshments. 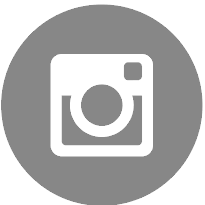 Follow updates from our group on Facebook, Twitter, Instagram, LinkedIn, and WordPress. Are you passionate about science policy? Want to organize our next speaker event? Maybe you want to help young scientists find careers in science policy? If so, all of our committees are actively recruiting new members! If you are interested, email spg.uiuc@gmail.com for more details! Don’t forget about our policy writing game night tomorrow at 4:30 pm in Room 1005 Beckman Institute! Dr Clifford Singer, the Director of the Program in Arms Control and Domestic and International Security at UIUC, will moderate the event. Refreshments will be provided! Subscribe to our listserv: here.